I've been really enjoying banana vapes lately, Puff'd is one of my favorites. The combination of cake and light banana gooeyness is just lovely. If you enjoy it please remember to leave a rating. Short notes for this one as it's Friday night and I want to play. Pro Tip: To boost the cake note even more, Throw in DIYFS Pound Cake @ .25% if you have it on hand. Omitted from the public recipe for the sake of availability. CAP Sugar Cookie It's inclusion is intended to boost the bakery note. The sugary graininess really helps the overall mix. TFA Bavarian Cream Playing as a not-so-shy emulsifier in this recipe as it serves to thicken and provide some vanilla boost, As well as providing a 'buffer' between the cream and pastry. JF Yellow Cake A little light handed here it serves as a cake backnote allowing the "cream" to shine a little more. FLV Frosting Up front vanilla with a little texture to bring to the game. 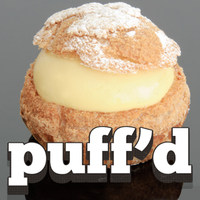 Provides an almost gooey sugary perception to the cream filling. Pairs incredibly well with 'cake' concentrates. CAP Super Sweet When I mix this recipe I omit sweetener, But including it you'll find brings it more toward the traditional "manufacturer" variety. Really good! I'm usually not too keen on banana Vapes but this one is spot-on. I subbed flavor West yellow cake for the jungle flavors because that's what I had on hand. Great mix. I'm usually not a fan of most banana mixes but I wanted to at least try it, well because it's yours. That VT banana custard sits nicely on top and blends really well with the Bavarian Cream and Frosting. My only critique is that I would like a little more bakery underneath. I may try boosting the sugar cookie and yellow cake just for my own palate. Thanks for the excellent recipe! wow! I went into this with low expectations being I just started following you but man oh man this stuff is good! definitely going in my regular rotation. you the man Steam!